We are located in Keld, in the Yorkshire dales. If you’re approaching from Richmond or Reeth on the B6270, as you approach Keld you will pass Keld Lodge on your left hand side. Continue straight on for approximately 600 meters, passing a pair of houses on the right hand side after about 300meters and then as you come round the corner you will see us at the bottom of the hill on the right hand side and the entrance is clearly marked with our ‘Keld Bunkbarn’ sign. If you are approaching from Kirkby Stephen on the B6270, as you near Keld the road will narrow with walls on either side. You will pass some large rocky cliffs on the left hand side and you’ll run parallel to the river. 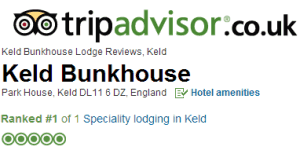 Continue on and you will see the turning for Tan Hill and we are immediately on the left hand side, with the entrance clearly marked with our ‘Keld Bunkbarn’ sign. If you are approaching from the A66 (please note this is not suitable for long or heavy vehicles) follow the signs to Tan Hill. After 3 miles you will pass through the small village of West Stonesdale and then you will come down a very steep sharp zig zag bend. You will then cross the bridge over the river and we are immediately on the left hand side with the entrance is clearly marked with our ‘Keld Bunkbarn’ sign.